Tabs Studio is a Visual Studio and SQL Server Management Studio extension that organizes document tabs and cuts software development time. Tabs Studio lets you group your document tabs intelligently, and makes all of your document tabs visible by creating multiple rows of tabs. When working on large solutions with 20 or even 30 tabs open at the same time, it can be frustrating finding documents that are already open. Tabs Studio lets you immediately switch to another tab with a single mouse click or a few keyboard shortcuts. It's easy to remove the path from a tab name, and to color-code your tabs meaningfully. Instead of displaying tabs in multiple rows, you can show them vertically in a separate tool window. Runtime Flow in real time monitors and logs function calls and function parameters in a running .NET application and shows a stack trace tree. No instrumentation or source code required for monitoring, but if you have source code (e.g. C#, VB.NET or C++) then Runtime Flow automatically uses solution settings to start logging and for any function you can go to its source code. In a large .NET application it allows developers to quickly identify classes and functions relevant to the bug. Runtime Flow supports monitoring of .NET 2.0 - 4.7 desktop, .NET Core, ASP.NET and Silverlight 4/5 applications. It can work as a standalone application and can be integrated in Visual Studio. Task Canvas lets you edit multiple methods from different classes in one window that you can position alongside the main Visual Studio 2015/2017/2019 window. It significantly reduces tab switching and jumping from place to place within a file. Task Canvas interface is task-focused to reduce information overload and make multitasking easy. All currently open document tabs and code blocks are automatically saved in the current task context. It is most useful when you have repeatable periodic tasks or work on several tasks in parallel. Visual Time Spent automatically tracks your time spent working on solutions, projects and documents in Visual Studio. You can generate reports to see overall time spent and what activities took most time. All your activity such as editing and browsing in Visual Studio automatically recorded to a database. The reporting tool lets you specify report period and displays summary of your activity grouped by solution/project/window and sorted by time spent. Idle time (when you don't use Visual Studio for more than 2 minutes) is automatically excluded from the report. Visual Commander is a freemium extension that lets you automate repetitive tasks in Visual Studio 2019/2017/2015. You can reuse existing Visual Studio macros from previous versions of the IDE and create new commands and extensions in C# or VB. You can also record and playback keyboard commands for the Visual Studio text editor. Continuous Formatting automatically formats your code in Visual Studio 2017/2015 as you type. No more manual reformatting on code changes. 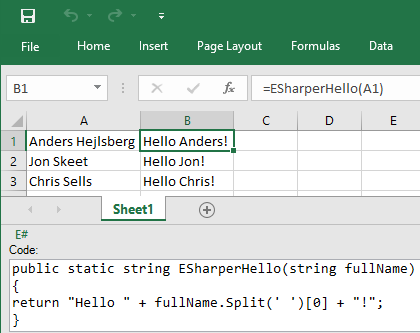 ESharper add-in lets you interactively write lightweight user defined functions and commands in Excel 2013/2016/2019 using C#. As you change code in the custom task pane, the updated functions immediately become available in the current running Excel instance. You can use C# 4.0 language features when .NET 4 is installed and C# 5.0 features when .NET 4.5 is installed. You can create global functions available for any workbook on your computer and workbook functions stored in a .xlsx file. Regent creates search and replace regular expression from a single example to update all similar text fragments at once. You don't need to remember different regular expressions rules and special characters anymore. Regent supports regular expressions syntax used in the Microsoft Visual Studio Find and Replace dialog (2005, 2008 and 2010 editions), Microsoft Word (XP, 2003 and 2007 editions), Perl compatible regular expressions (UltraEdit, NoteTab Light and EditPad Pro) and standard ECMAScript syntax. Tabs Studio Personal + Runtime Flow Personal + Visual Time Spent Personal + Visual Commander Professional + Continuous Formatting + Task Canvas Personal + ESharper Personal + Regent. Text Sharp is a free extension that lets you adjust text clarity in Visual Studio 2015, Visual Studio 2017 and Visual Studio 2019 IDEs. You can select Aliased, Grayscale or ClearType text rendering mode for Visual Studio menu, tabs and editor windows. You can also fine tune text formatting and text hinting modes. Favorite Documents is a free extension that lets you create links to frequently used code files and then quickly open them as a group or individually from the Favorites menu in Visual Studio 2019, Visual Studio 2017 and Visual Studio 2015. You can also create links to solutions, Solution Explorer items and Source Control Explorer folders. Fix File Encoding is a free extension that prevents Visual Studio 2015 - Visual Studio 2019 from adding BOM to UTF-8 files. 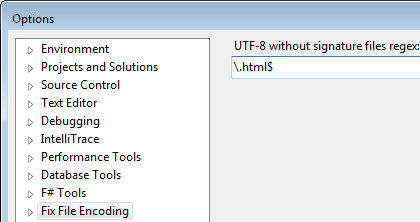 It automatically detects when a UTF-8 file is opened in Visual Studio and sets its encoding to UTF-8 without signature. You can configure which files to encode based on the file path and the file extension. Sync Block Edit is a free extension that lets you easily update duplicate blocks of text in multiple files from Visual Studio 2015, Visual Studio 2017 and Visual Studio 2019. It performs multiline search and replace in Visual Studio with you only pointing what changes to propagate. Remember Window Size is a free extension that remembers size and position of the Refactoring - Rename - Preview Changes window in Visual Studio 2010, Visual Studio 2012 and Visual Studio 2013. Smooth Caret is a free extension that adds smooth caret movement animation for text editors in Visual Studio 2015/2017/2019. It looks similar to the smooth typing feature in Microsoft Office 2013. Disable Outlining Undo is a free extension that excludes expanding and collapsing operations for a method or a code region from recording to the undo/redo stack in Visual Studio 2017/2019.